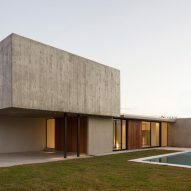 The cantilevered concrete volume that tops this minimal home in La Plata, Argentina, was designed by architect Felipe Gonzalez Arzac to look as if it is "suspended in the air". Casa REX is a three-bedroom residence that the Argentinian architect designed for a family in the neighbourhood of City Bell. It forms part of a residential area in La Plata – a relatively new city known for its orthogonal street grid. The two-storey home occupies a corner lot in the suburban neighbourhood of City Bell, and encompasses 230 square metres. 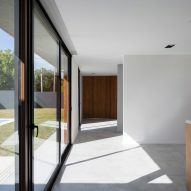 From the driveway, visitors access the home into one leg of an L-shaped plan. The smaller, second floor juts out above two parking spots, covering the entrance. 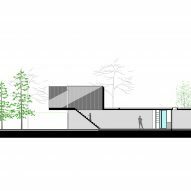 It is supported by slender columns and partially cantilevered. 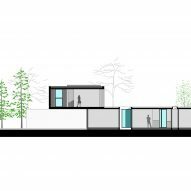 The concept of the home "arises from the idea of ​​creating an architectural object of sculptural character, defying gravity, suspended in the air," according to a project description from Felipe Gonzalez Arzac. 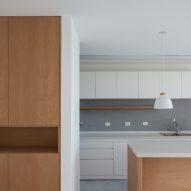 The board-marked concrete is imprinted with the wooden planks to give the volume a different reading than the rest of the home, which was built in a minimal palette of white surfaces, sliding glass walls, and wooden accents. This gives it a "surprising presence for the human eye," said the studio. 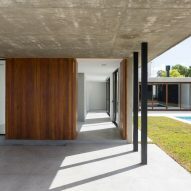 The board-marked concrete is imprinted with the wooden planks to give the volume a different reading than the rest of the home, which was built in a minimal palette of white surfaces, sliding glass walls, and wooden accents. This gives it a "surprising presence for the human eye," said the studio. 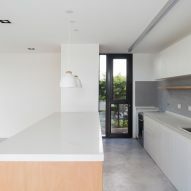 The ground floor includes three social areas for the residents. 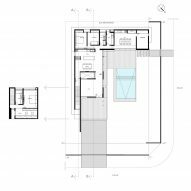 Near the entrance, a living room and open-concept kitchen and dining area are separated by an interior courtyard. Towards the back of the home, a multi-purpose space with a grill can be used for hosting larger gatherings. These spaces are connected from the interior, but also face the pool in the centre of the L-shaped plan. "All these spaces are constantly linked to the centre of the ground that is the pool," said Felipe Gonzalez Arzac. "Everything looks towards the centre." Behind the kitchen are two bedrooms for the owner's children, friends, or occasional visitors. These are located away from the gathering areas for additional privacy. 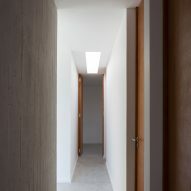 A skylight illuminates the stair that leads up to the master suite, which the architect likens to "an opening to the sky". Upstairs, the owners enjoy their own en-suite bathroom as well as a walk-in closet. 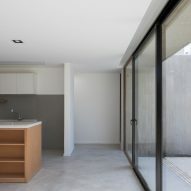 This volume is far less open than the ground floor, offering selective punched windows instead of full-height glazing. "Without connection to the outside, the inhabitant remains silent and isolated from the rest." 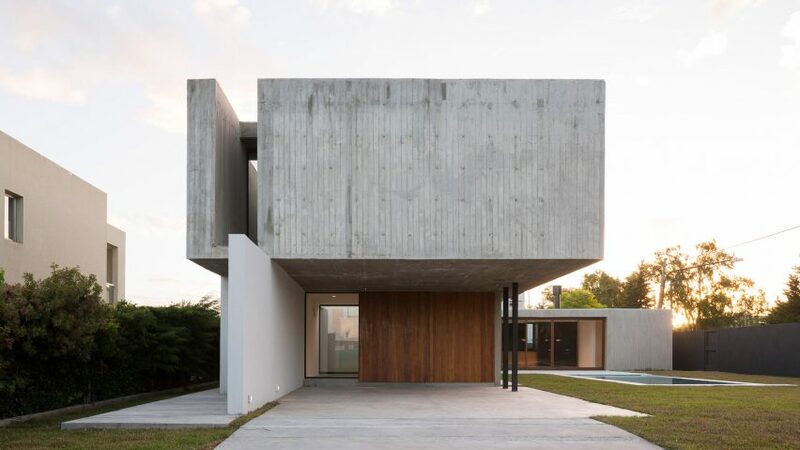 Concrete is a popular construction material in Argentina, and has featured in several residences by Luciano Kruk. 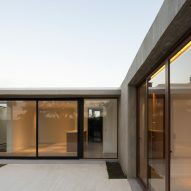 Other projects that use it include a house by BP Arquitectura, which uses it as a monolithic shading element and Casa CA by Pablo Gagliardo, where a large overhang creates a double-height patio. Photography is by Javier Agustin Rojas.